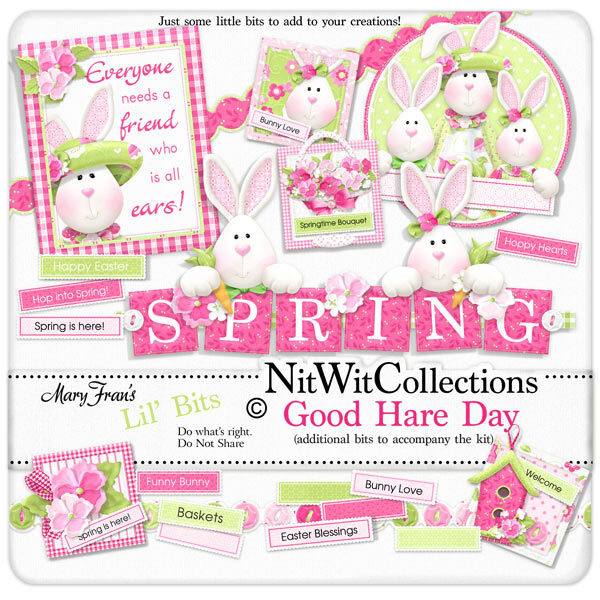 Lil' Bits "Good Hare Day" gives you all of the premade digital elements that are so convenient to use in your layouts and cards. Whether you are using this Collection for a Spring or Easter theme, we have got you covered in this digital element pack. These digital elements are NOT included in the FQB "Good Hare Day" Collection. 1 Square element of a flower cluster and the words "Spring is Here!" 1 Square element with a smiling lady bunny letting you know about "Bunny Love"
1 Wordart - "Happiness is...."
1 Wordart - "Everyone needs a friend....."